BARK UP THE ART TREE: “Danger Dogs—Folk Art from the Himalayas” will be on display at Big Sky Café through June 16. 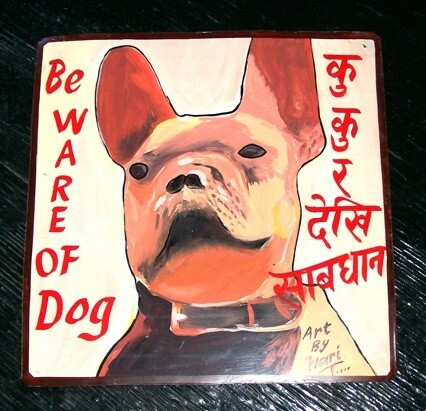 Michelle Page’s artists often misspell the signs that she commissions them to paint, producing a signboard that instead reads “bewar of dog,” “be ware of dog,” or, her personal favorite, “be aware of dog.” And they sometimes end up selling a piece that she commissioned to a tourist passing by their shop. Many a businessperson might recoil at these breaches in professionalism and grammar, but to Page, the unpredictable lends a greater charm to her work with Nepali signboard artists. Those interested in catching a glimpse of Page’s dangerous dogs, along with the cats, birds, and ferrets that joined their ranks in recent years, can view an exhibit of the signboards at Big Sky Café through June 16. Peaches, who belongs to restaurant owner Charles Myers, is among the canines who have had their visages captured on signboard. 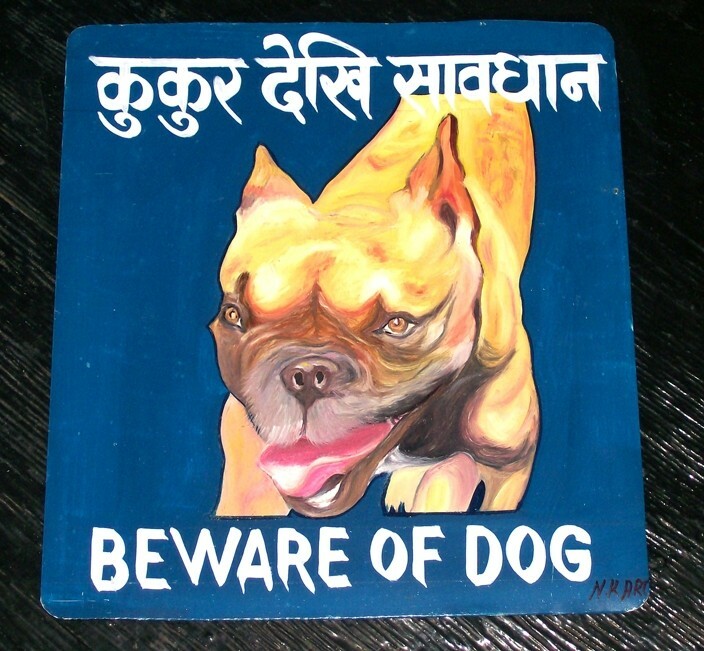 The Danger Dog project began in 2004, when Page began to notice that many of the handpainted signs, warning viewers to Beware of Dog or indicating the nature of a business or shop, were disappearing from Nepal. In their place stood pre-printed or stenciled notices, lacking the eccentricity and personality of their forebears. Page worked as an assistant film editor and would spend 15 to 16 months working without pause, then spend her vacation time traveling. Nepal, with its rich geographical diversity, captured her imagination and empathy. 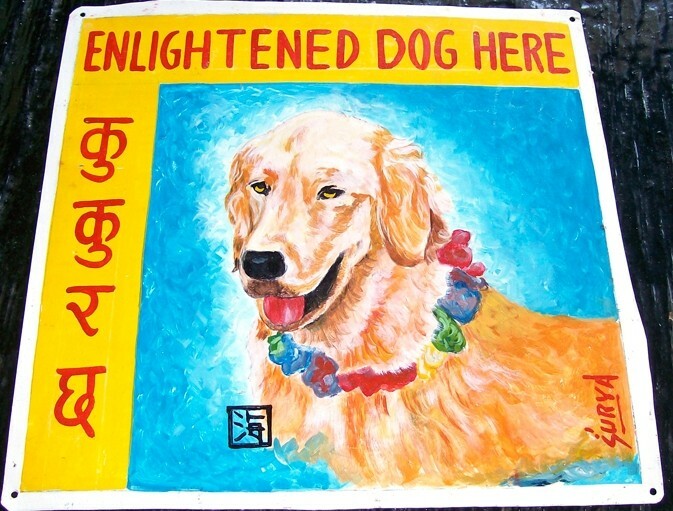 To provide Nepali signboard artists with an income flow, Page began to accept commissions from her American friends and acquaintances for signboard pet portraits. 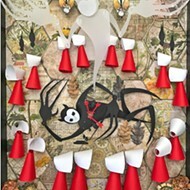 She estimates that she has worked with 52 artists in the past five years, with a core group of 32. But in order to find them, the American combed the streets of Kathmandu, the nation’s capital, looking for the word “kala” which means art. All of Page’s artistic associates are male due to the fact that female artists in Nepal do not work with signboard. Most were initially reluctant to work with her despite the fact that she was offering fair trade prices. Because she speaks limited Nepali and many of the artists are equally inarticulate in English, Page often communicates with their English-speaking children. Most schools in Nepal teach English, and a quality education is generally the highest priority of every parent. For the artists, Beware of Dog signs serve a functional purpose, and many failed to grasp the ironic or playful undertones of the piece; they wanted to paint ferocious or gritty canines. And the cat portraits that soon followed really made no sense. In Nepal, cats are useful rodent hunters. Ferrets, birds, and hamsters were soon to follow. Then, some of the animals were no longer dangerous. Customers began requesting Enlightened Dog portraits, or Happy Dog, Zen Dog, or Smiling Dog. Page visits Nepal twice a year, two months each time, bringing with her the pet photographs she is charged with acquiring. 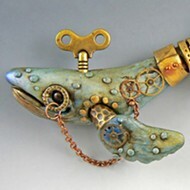 Patrons specify which style they prefer—naïve, realistic, or colorful. Page returns with a minimum of three choices from three different artists, and upon selecting their portrait of choice, the client pays the $250 fee, plus shipping. The leftover portraits are sold at random for $100 to $200. 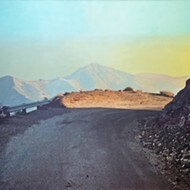 While in Nepal, Page delivers the photographs to her artists of choice, matching each painter with the dog and attitude that best suit their style. No two painters ever produce the same dog. Dilip, who operates his shop in the Mitra Park region of Kathmandu, initially refused to paint any breed besides the aforementioned Dobermans and shepherds. He has since painted a portrait of a black lab, but Page makes a point of giving him what she refers to as “dog’s dogs.” Prem favors “Bewaer of Dog” as opposed to the more common “Be Ware of Dog.” Pokhara painter Santosh Shrestha likes to paint his dogs against a backdrop of Elysian fields. Sufraj initially selected rottweilers, basset hounds, and Australian shepherds from the packet of photographs that Page offered. Hari Prasad likes to paint urban dogs. Due to flagging economic factors, Page recently lost four artists to contract work in other countries. Headhunters offer Nepalese men three to three and a half year job contracts in South Korea or Saudi Arabia, and the men accept in order to support their families, who remain in Nepal. The headhunter then receives the worker’s first six months worth of wages as a finder’s fee. And those who remain behind are not immune. Page doesn’t anticipate a pleased response to the reduced number of commissions she will bring to Nepal in June. “I don’t suppose a Beware of Dog sign from Nepal is anyone’s idea of something they have to have,” Page admitted, referring to the recent recession. But while the kennel clubs that she initially planned to market to expressed little to no interest in the work, galleries and curators have eagerly purchased and exhibited the Danger Dogs. 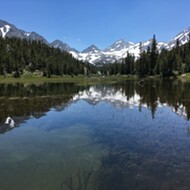 It’s a coup for Page to be able to show her artists photographs of their work prominently displayed in galleries and museums on the other side of the globe. When Barack Obama won the presidential election last November, Page happened to be in Nepal, and she commissioned two dozen portraits of the United States’ 44th president. And she plans to expand to commissions of people’s houses as well in order to keep the art fresh and the artists in work. Along the way she will continue to emphasize the fact that the signboard painters are artists, whether their subject is a smiling golden retriever or sneering Doberman. After all, Renoir painted Madame Renoir with a Dog, Picasso had his Boy with Dog, Andrew Wyeth captured man’s best friend in Ides of March, and Warhol painted a daschund in Portrait of Maurice. Fido can now join their ranks, be he enlightened, happy, zen, or, the adjective that never seems to go out of style, dangerous. Arts Editor Ashley Schwellenbach can only aspire to canine nobility. Send chew toys to aschwellenbach@newtimesslo.com.